Science of Agriculture 2014 Play it Now ! 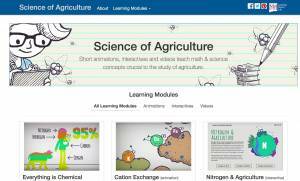 Short animations, interactives and videos teach math & science concepts crucial to the study of agriculture, this suite of learning tools developed to attract and retain underrepresented undergraduate students in soil and environmental sciences. Researchers and media developers created educational animations and interactive modules, based on identified gaps between student current knowledge and the knowledge required for success in a STEM career.